This article talks about basic disk and dynamic disk as well as methods to convert dynamic disk to basic. Some method has to delete all volumes before converting dynamic disk to basic, while some method is able to do the conversion without losing data. 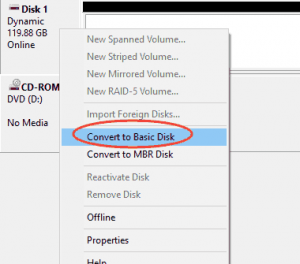 In this guide, you can learn what is dynamic disk and basic and three methods to convert dynamic disk to basic, including the way to convert to basic disk without data loss. 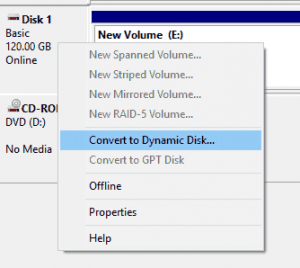 What is a dynamic disk and basic disk? When it comes to storage types, there are disk types: basic disk and dynamic disk. Such storage types are different from concepts like physical disk and partition style, but they are related to each other. For instance, the basic disk does not equal to a certain partition style. A physical hard drive can be divided into one or more logical regions which are called partitions, and partitions are created when the hard disk is formatted as a basic disk. Basic disk, usually used under Windows, is a storage type. It refers to a disk which contains partitions like logical partition and primary partitions which are formatted to a certain type of file system so that they can be used to store data. Basic disk supports various disks, such as IEEE 1394 (Institute of Electrical and Electronics Engineers), USB removable drive, etc. It supports both MBR (Master Boot Record) partition style and GPT (GUID Partition Table). For More information about MBR and GPT partition type, please read MBR VS GPT. Partitions on basic disk can be resized, which means you can extend or shrink partition, or add unallocated disk space to existing partitions. Windows Disk Management is able to extend partitions which are adjacent and formatted as NTFS file system, or extend a logical partition with contiguous free space. For other situations that Disk Management cannot handle, you can use third-party partition manager to resize or move partition. Dynamic disk contains features which are not available on basic disk, for example, it is able to create volume which span multiple disks and create fault-tolerant volumes. Partitions on dynamic disk are called dynamic volumes. As with basic disk, dynamic disk also supports MBR and GPT partition format on operating systems which supports them. Compares with basic disk, dynamic disk provides greater flexibility to manage volume, as it makes use of a database to trace information for volumes and other disk on the computer. Each dynamic disk stores a backup of the database so that a corrupted disk database can be repaired by using the database on other dynamic disk. Database is located depending on the partition style of the disk. Database is stored in the last 1MB of MBR disk, or it is located in a 1-MB reserved hidden partition of GPT disk. Volumes on dynamic disks are allowed to contain noncontiguous extents on one or more physical disk. Dynamic disk and volumes count on LDM (Logical Disk Manager), VDS (Virtual Disk Service) and related features. These features allow users to perform various operations, for example, convert basic disk to dynamic, create fault-tolerant volumes, create RAID-5 volumes, remove a mirror from mirrored volume, etc. Basic disk vs dynamic disk, what is the difference? Basic disk vs dynamic disk, what is the difference? Which one should be chosen to your computer? This part will give a brief list of differences between basic disk and dynamic disk. Partition management. 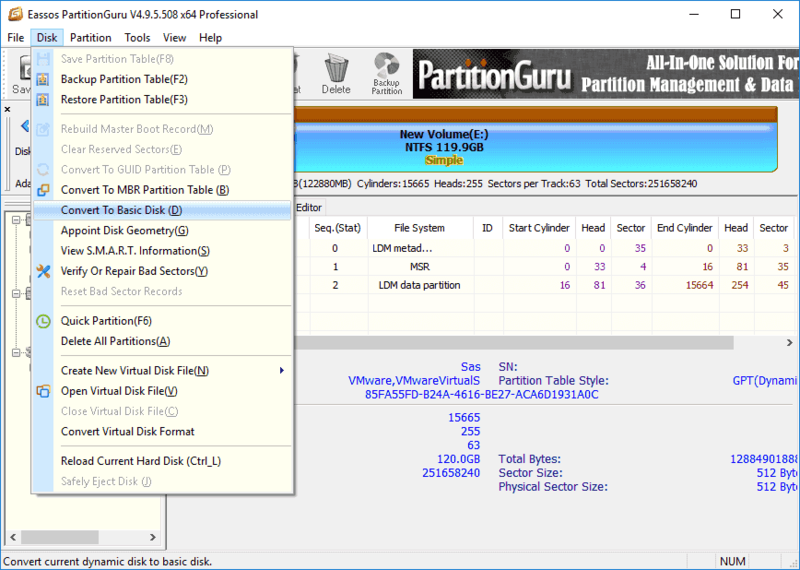 Basic disk uses partition table to manage all partition, and dynamic disk manage volumes via a hidden LDM database. Supported system. Basic Disks is supported by all Windows and include MSDOS, Win95/98/Me/NT/2000/XP/2003/2008/Vista/Windows7/8/10; Dynamic Disks is supported by Win2000/XP/2003/2008/2011/2012/Vista and Windows 7/8/10, but isn’t supported by MSDOS, Win95/98/Me/NT and Windows XP Home Edition. Disk partition. Basic disk contains one set of contiguous extents on a single physical disk, while a dynamic disk can consist of noncontiguous extents on one or more physical disks. Volume type. Partitions on basic disk are primary partition or logical partition; on dynamic disk you can create simple volume, spanned volume, mirror volume, stripped volume, and RAID-5 volume. How to convert basic disk to dynamic disk? 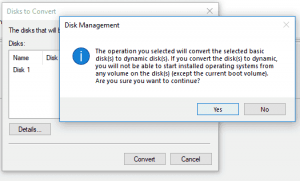 Windows Disk Management provides the feature to convert a basic disk to dynamic disk and you can follow these steps to complete the conversion. Before you start this process, you should note that this process may cause data loss or system boot issue and you should create a backup for important data. Step 1: In Windows 10, right-click Start button and select Disk Management from menu list. Step 2: Locate the disk you want to change to dynamic disk, right-click on the area that displays Disk #, Basic, capacity, etc. and select “Convert to Dynamic Disk” option. Step 3: Select the basic disk you want to convert and click OK button. Step 4: Click “Convert” button, and the “Disks to Convert” window prompts the disk will be made dynamic. The following part presents three methods to convert dynamic disk to basic disk. 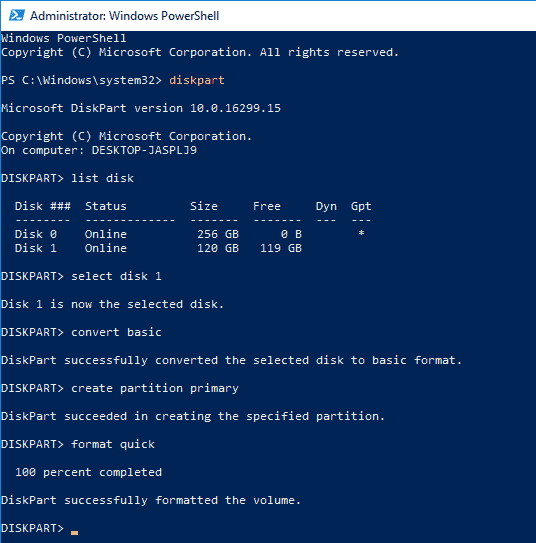 Method 1 performs converting using Diskpart command, and Method 2 converts disks in Disk Management. Both methods cause data loss issue and you should create a full backup for important data before trying these solutions. The third method is using Dynamic disk converter to convert dynamic disk to basic, which does not cause data loss. 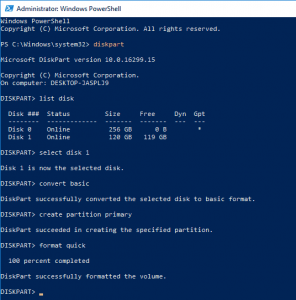 DiskPart command is able to change dynamic disk to basic, but this process will delete all partitions and data on the disk. 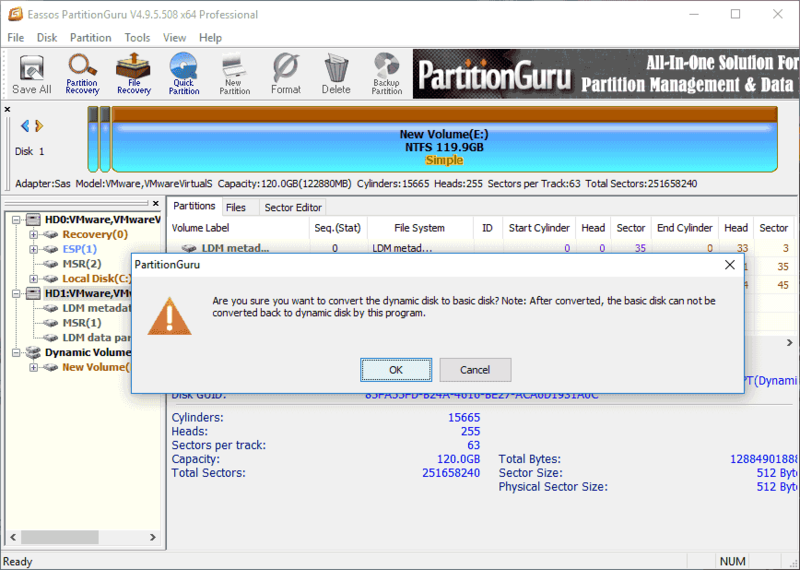 Once the disk is converted to basic, you have to create new partition on the disk so that you can store new data on it. Step 1: In Windows 10, right-click Start menu and select “Windows PowerShell (Admin)” option. This will open Windows PowerShell as administrator. Step 2: Type following command one by one and press Enter Key after each command. Step 1: Open Disk Management and find the dynamic disk in the disk list. 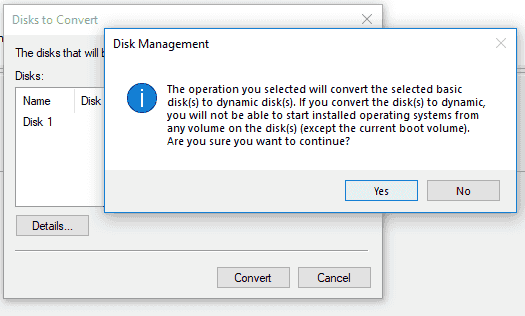 Step 2: Delete all volumes on dynamic disk. Right-click on a volume on the disk and select “Delete Volume” from context menu; then click “Yes” button to delete the volume. Eassos PartitionGuru Pro, a professional dynamic disk converter, is able to convert dynamic disk to basic without losing any data. The process is simple and quick, if you do not want to remove everything from your disk, you can use this tool to convert disk. Apart from converting dynamic disk to basic, this tool can do a lot other tasks for you, such as convert disk between GPT and MBR without losing data, convert partition type, convert virtual disk format, etc. It supports all versions of Windows and Windows Server system. Step 1: Install and launch Eassos PartitionGuru Pro from your computer. Then locate the dynamic disk in the program. Step 2: Select the dynamic disk you want to change to basic, click Disk menu and choose “Convert to Basic Disk”. Step 3: Click OK button when PartitionGuru asks confirmation for the action. Step 4: Click Save All button and click Yes on the popup-up message box to complete conversion. This entry was posted in Partition Manager and tagged basic disk vs dynamic disk, change dynamic disk to basic, convert dynamic disk to basic, convert to dynamic disk, dynamic disk converter, what is a dynamic disk by EASSOS. Bookmark the permalink.